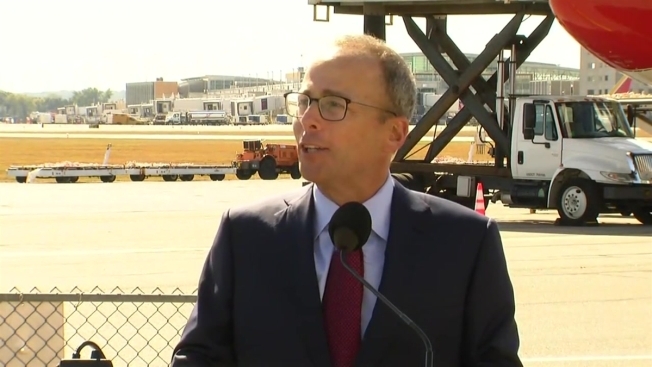 Jonathan Kraft, President of the New England Patriots, spoke at the unveiling of the Patriots' own Bowing 767 in Rhode Island on Wednesday. The New England Patriots are celebrating the inaugural flight of their very own customized Boeing 767. The team will be at T.F. Green Airport in Rhode Island on Wednesday before heading to Florida, where they play the Tampa Bay Buccaneers on Thursday. They'll take their customized aircraft, which is painted with the team's logo and red-white-and-blue colors, and includes the Pats' five Lombardi trophies painted on the tail. Jim Nolan, chief operating officer of Gillette Stadium, explained at the plane's unveiling Wednesday that the team can now bring all their people and equipment on every trip. He said they installed the widest and largest seats the plane can handle, and added five inches of legroom beyond a typical first-class seat. The team has two of the planes and will use one as a backup. T.F. Green Airport will house the planes. Nolan said the team looks forward to the partnership and that Coach Belichick is only concerned with the specifics of the plane, not where the planes are housed. "He really doesn't care where he flies out of," said Nolan. "All he cares about is efficiency and speed and lack of crowds." "We're so excited to be able to call T.F. Green our official airport," he added.